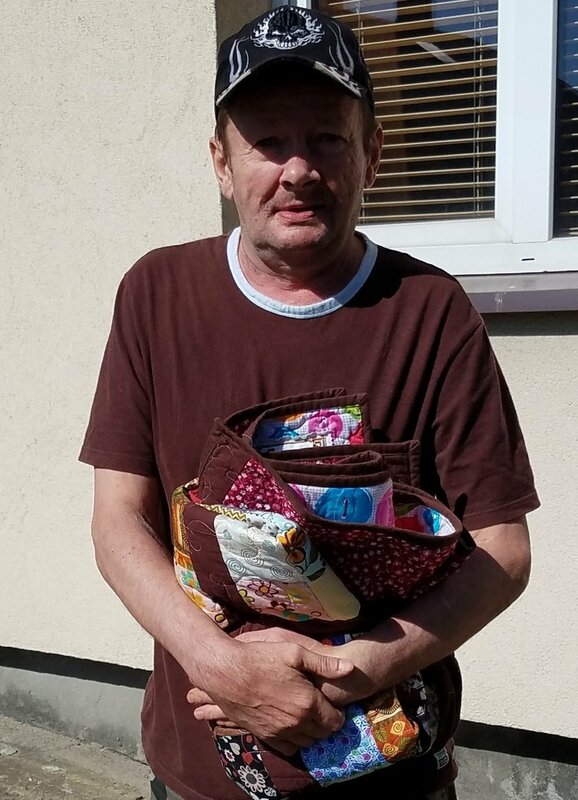 Many of us, when called upon to make a quilt for a teen guy or a man that we don't know very well are stuck when we want to make a quilt just for them! I've gleaned 6 tips or ideas that will help me make more guy-friendly quilts. OK, OK - transparency here - I asked my Facebook group - Becky Quilts in the Old Country - for pictures and ideas about guy quilts. They actively participated in helping me with this post! 1. Use a theme that they like such as sports, outdoors, techy, etc. Colleen Froats made this beauty for her husband who requested a porthole quilt. Isn't it great? Colleen Froats has a bunch of guys in her family who love geometrics. They fought over who would get this one! Mereie Bonaime made this one beauty for her husband who loves running! 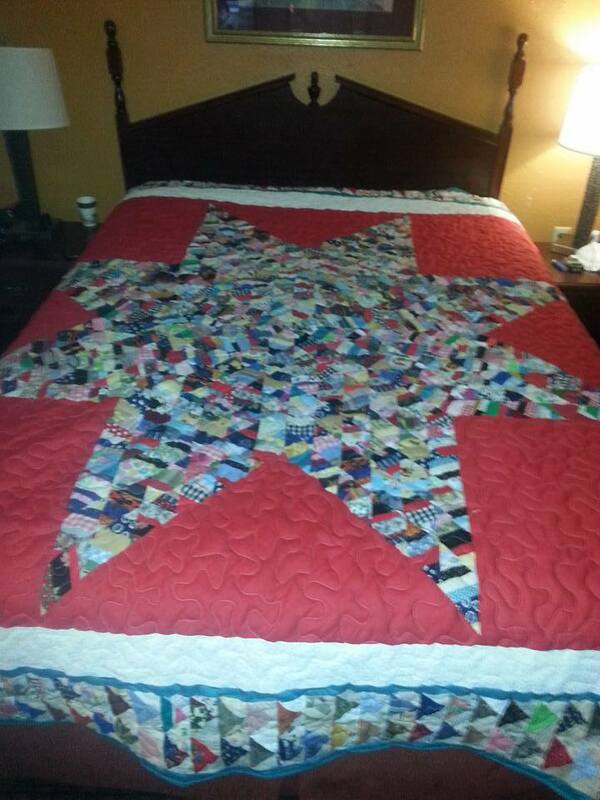 Louise Young made this handsome quilt for her dad! Lucky man! Sharon Henrie Lake made this one for a dog lover! Colleen Froats made this beauty for someone who loves the outdoors! Colleen Froats made this wonderful quilt featuring nature! Gorgeous! Gloria Jansen Charlton made this work of art for a guy! Sharon Henrie Lake made this produce themed quilt - great for that guy who loves raising things! 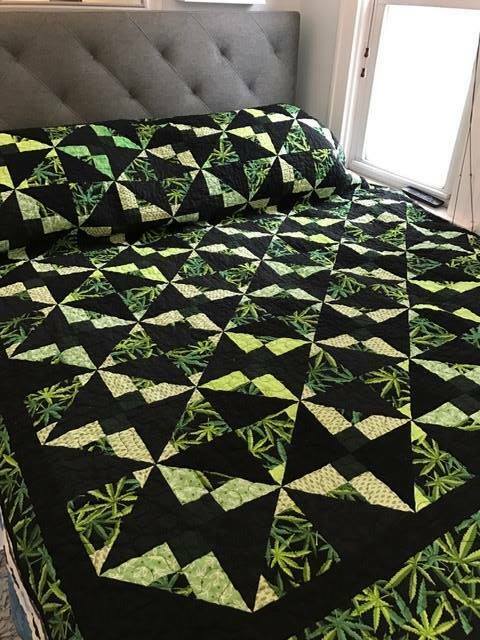 Sharon Henrie Lake made this striking herb themed quilt. But what about guys that don't have such hobbies/interests? What are some OTHER ideas? 2. Use solids in dark/bright colors like reds, blues, greens, browns. This was brought home to me when I was finishing up this one. My then 17 year old told me, "Mom, I really like that quilt." 3. Keep your overall color scheme "dark-ish". A man came through and took a beautiful (to me) quilt that had a lot of brown and pinks. He wanted THAT quilt. Sigh. I was hoping a lady would take it, but many had already had their chance (at a recent give away) and no one had taken it. There was actually a good bit of pink in it, so I thought it wouldn't appeal to a man. However, there was enough brown in it to give it the overall look of brown -- dark-ish. I guess this guy really likes brown as the pink this quilt didn't deter him from choosing this very attractive quilt. I had thought a lady would like it but since I used so much brown in it, a guy took it. Chris Wells pointed out that "dark" is in when it comes to guys! 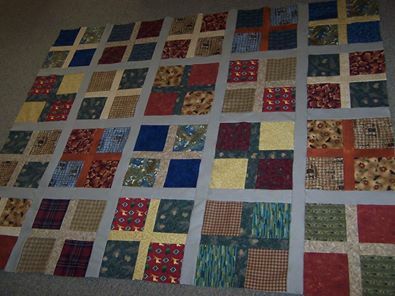 Sally Humphreys made this one for her brother - no florals in this handsome grays quilt! 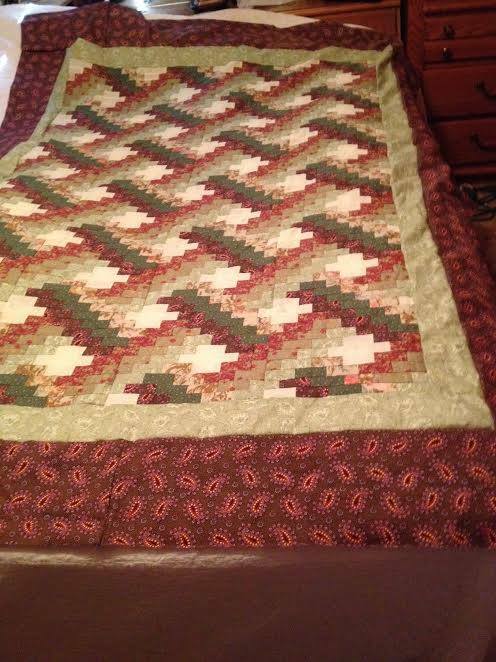 Sue Law made this beauty for her 26 year old grandson - he chose the fabrics - anther sure fire way to make sure the person likes them--have them choose the fabrics! Suzie Hardy stuck with a mostly red/white/tan/blue theme. This color scheme seems ready made for a man. 4. Use tans and off whites instead of a lot of white. Gloria Jansen Charlton made this fine quilt for a vet! Dale Hinshaw McMasters made this beauty - very guy-friendly! Suzie Hardy made this beauty for a very lucky guy! My husband really likes this one! Viola Swann made this handsome quilt for a guy! But anyone would love it, wouldn't they? 4. Use denim, flannels and plaids. Sure to be a hit! Katie Baker made this fun quilt for her grandson! 6. Upcycle men's shirts into a quilt. If the big name clothing designers figured that men would like those fabrics well enough to buy it as a shirt, then surely, they'll like it as a quilt! Right? Judy Robinette made this one from guys' shirts. Monika Gause made this for her son using his old shirts. Surely a hit! Thanks everyone for your beautiful quilts! I hope some of these ideas will help you come up with your next "guy" quilt - if you are stuck for ideas.